NOTE: Your Device Must Be Jailbroken. 1. 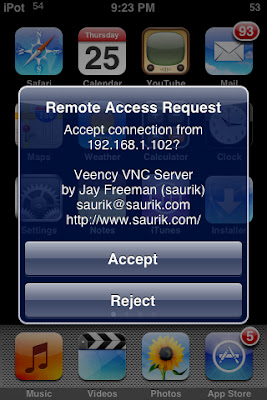 First open CYDIA from your iPod/iPhone,search for VEENCY in cydia install it. Settings>WiFi>Click the blue arrow (on your wireless network>Theres your ip address note it down. 5. 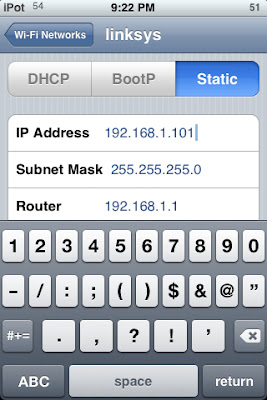 Type your IP ADDRESS in server column and click OK shown in screenshot. 6.Now look at your iPod/iPhone Springboard a confirmation box will pop up, asking you to accept the connection, just click Accept. Watch your PC screen you can control your iPod/iPhone through ur PC.